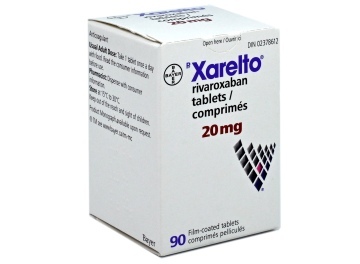 Xarelto (generic name Rivaroxaban) is a blood thinner medication and is used to for prevention of blood clots after major hip or knee surgery, prevention of blood clots in brain (stroke) and other blood vessels in case you have atrial fibrillation. It is also used for treatment and prevention of blood clots in your legs or lungs. Rivaroxaban is an anticoagulant and works by preventing blood clots from forming by directly blocking the activity of clotting factor-Xa. If you are diagnosed with any of the above-mentioned conditions, your doctor will discuss the most effective treatment for your particular condition. Canada Drugs Online is proud to offer you brand Xarelto from Canada manufactured by Bayer. Please call our toll free at 1-877-900-3784 for details. We also carry the brand Xarelto from Australia, Turkey and United Kingdom manufactured by Bayer. There is no generic available for this medication. CanadaDrugsOnline.com also carries other Blood Thinners and Canadian prescriptions such as Zetia and Crestor. As with any drug, there may be side effects from taking Xarelto. Some of the common side effects of Xarelto include nausea, vomiting, stomach ache constipation, diarrhea, indigestion, decreased general strength and bleeding from surgical wound, unexpected bruising, reduction in red blood cells, bleeding into the eye, bleeding from stomach, genital bleeding, bleeding under the skin, low blood pressure, unusual fast heartbeat, itchy skin rash, bleeding gums. Some other side effects include liver disorders, bleeding into brain, skin reactions and decreased urine output. If you experience any side effects (including the ones not listed here), stop taking the medication and seek medical attention immediately. You should follow the instructions of the doctor who prescribed Xarelto to you. Directions and dosage information can also be found on the pack or leaflet inside the pack. Brand Xarelto comes as tablet in the dosage form of 2.5 mg, 10 mg, 15 mg and 20 mg. Try to take your tablets at the same time each day. You should continue to take your medicine even if you do not feel better, as it may take a few days for your medicine to work. Swallow the tablets whole with a glass of water. The tablets may be crushed and mixed with applesauce. Take it right away after you have mixed it. A crushed 10 mg tablet can be taken with or without food. Eat food right after taking a crushed 15 mg or 20 mg tablet. Xarelto should be stored at room temperature of 15°C to 30°C, in the bottle or package provided by the pharmacist. It should be kept out of the reach and sight of children. If you are allergic to any of the ingredients of Xarelto, you should avoid taking it and inform your doctor. You should also not take Xarelto and consult your doctor, if you have severe liver disease, have active bleeding, are aware of body wounds or injuries at risk of bleeding in brain, stomach or gut, are pregnant or breastfeeding. Take special care when using Xarelto if you have increased risk of bleeding, uncontrolled very high blood pressure, active ulcer in your stomach, recent bleeding in your brain, have problems with blood vessels in your brain or spinal column, had a recent operation on your brain, spinal column or eye, have a chronic disease of airways in your lungs, have a history of bleeding into your lungs, are older than 75 years of age. Xarelto is not recommended if your doctor determines that you are not able to maintain an adequate blood pressure, are taking drugs to break down your blood clots, have been scheduled for emergency surgical removal of blood clots from your lungs, are going to have surgery for any reason that involves injection of a catheter in your spinal column, have galactose intolerance, lapp lactase deficiency, glucose-galactose malabsorption, have severe kidney disease. If there is a chance that you could become pregnant, use a reliable contraceptive while you are taking Xarelto. If you become pregnant while you are taking Xarelto, immediately tell your doctor, who will decide how you should be treated. You must consult your doctor if you are taking any other medications as they may interact with Xarelto, including anticoagulants (blood thinners) such as warfarin, apixaban, ticlopidine, prasugrel, ticagrelor, oral medications to treat fungal infections such as ketoconazole, medications for HIV/AIDS such as ritonavir, anti-inflammatory and pain-relieving medicines including non-steroidal anti-inflammatory drugs (NSAIDs), some antibiotics such as clarithromycin, rifampicin, anticonvulsants such as phenytoin, medicines to treat depression and/or anxiety Do not stop taking XARELTO without first talking to your doctor. If you stop taking Xarelto, blood clots may cause a stroke or other complications. This can be fatal or lead to severe disability.